TEMPUR-Flex Prima Review- Good Choice For You? Home » TEMPUR-Flex Prima Review- Good Choice For You? The TEMPUR-Flex Prima is the most affordable mattress within the Flex Collection. The Flex collection is designed to provide a hybrid feel where you get the best of both worlds between memory foam and springs. It’s a good collection if you want pressure relief but don’t like the feeling of sinking in too much into your mattress. The Flex Prima has a thin stretchy cover, similar to the other Tempur-Pedic models. Immediately below that is a layer of TEMPUR-ES material. This is a softer material that is used in all the Cloud collection mattresses. It’s a thinner layer, though, so it doesn’t make the mattress too soft. Below the ES layer is a layer of TEMPUR-Response material. This is foam that is formulated to be fast-responding. It returns to its original shape much faster than any other foam material you will find in other Tempur-Pedic mattresses. Below the comfort layer is a system of individually wrapped coils. This is a strong support system that is also very durable. Below this is a very thin base layer. Tempur-Pedic doesn’t disclose the thickness of individual layers, but the mattress overall is ten inches thick. It also doesn’t disclose the densities of its foams, but I do know for a fact that the company uses high-quality, high-density foams. This mattress is built to be durable and last you a long time. The design of this mattress has the intention of having the benefits of both springs and memory foam. The springs are highly supportive and the memory foam has great pressure relief. The foam used here is such that you don’t sink into the mattress too much and feel stuck. The company is very explicit in stating the firmness level of every one of their mattresses. 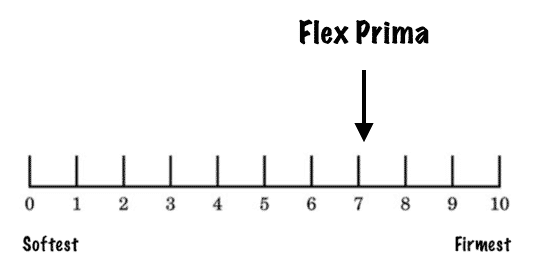 In this case, the Flex Prima has a medium firmness and is the firmest in the entire Flex collection. You Want A Memory Foam Feel But Don’t Like Sinking In Too Much– This mattress has faster responding memory foam in it. Combined with the coil unit, the mattress overall is much more responsive than the other Cloud or Contour models. If you want the benefits of memory foam but don’t like sinking into the mattress and feeling like you get stuck (which is one fairly common complaint about Tempur-Pedic), this mattress could be a good choice. You Sleep Mainly On Your Back/Stomach– This is the most firm mattress in the Flex collection. As a result, it is probably better suited to people who sleep mainly on their back/stomach. You Prefer A More Conventional Mattress Feel– If you are used to more conventional mattresses and like that feel, this mattress will be more similar to what you are used to compared to the Cloud or Contour collection models. You Sleep Mainly On Your Side– This mattress is pretty firm, so for most people it won’t be the best match if they sleep mainly on their side (take a look at something like the Cloud Supreme or Cloud Elite for something softer). You Like Sinking Into Your Mattress– If you like a memory foam feel where you slowly sink into your mattress and it envelops you, then you might want to take a look at some of the other models available. The Flex line is still very new (came out in 2015), so there is not a lot of review data available to collect on this mattress. It’s therefore too early at this point to say what the most common pieces of praise and complaints are from owners. Which is the best Tempur-Pedic model for you? This is still a pretty new mattress, but it’s clear how different the feel is from the Contour or Cloud mattresses. If you want some of the benefits of both springs and memory foam, this could be a good option for you.